There is an all-female Yazidi battalion fighting Daesh (ISIL/ISIS) in Iraq alongside the Yazidi self-defense forces for liberation of their land from the jihadist militants. Sputnik Arabic sat down with one of the female fighters to learn the details of their day-to-day fighting. Near the front lines of northern Iraq, there are a number of volunteer brigades comprised of locals who have taken on the bold task of defending their villages from Daesh. 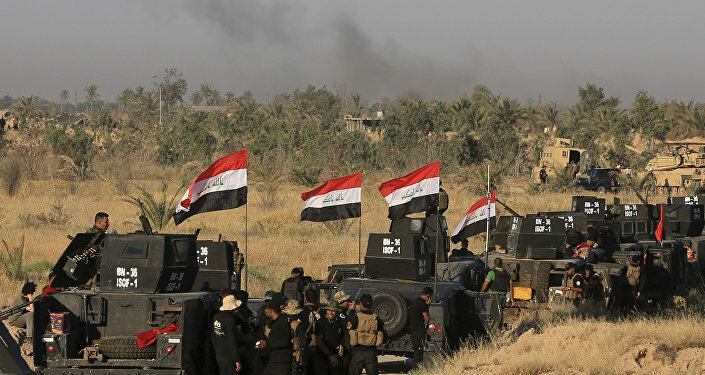 They are located west of the city of Mosul, the self-proclaimed Islamic caliphate's largest stronghold in the country. One of the villages, Wadi Shlo, is being defended by an atypical battalion – an all-female Yazidi group. The Yazidis are ethnically Kurdish and native to the region; they practice their own monotheistic religion. Faced with the prospect of living as slaves under Islamic fundamentalist tyranny, these ladies chose instead to put on military uniforms, take up arms and look bravely into the frightening eyes of the terrorist threat. Every female soldier has her own task: while some exchange fire with the enemy on the front lines, others provide the support functions that are essential to any fighting force. Sputnik Arabic sat down with one of the front-line soldiers to learn the details of their day-to-day fighting. Red-haired 22-year-old Wadhat Khalil Salekh took part in the liberation of Sinjar province, and has been involved since the very first days of the operation. She told Sputnik that female brigades have conducted a number of offensives over the last several months to liberate their homeland from Daesh. There are hundreds of Yazidi women and girls fighting the terrorists alongside Yazidi men. 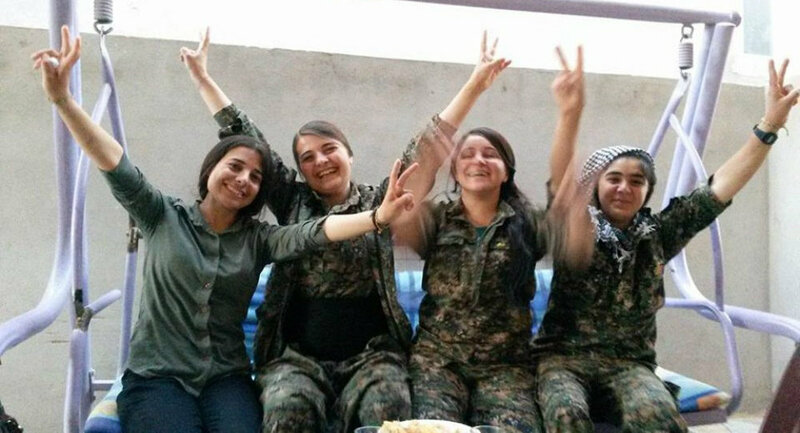 “I decided to join one of the female battalions, Yekîneyên Jinên Sengalê, since the terrorists committed genocide against our people in August, 2014,” she told Sputnik. “Now I am taking part in the military operation in Sinjar province to fully liberate my homeland from the terrorists,” she added. Wadhat, together with her two sisters, has killed scores of terrorists. Her task is not only fighting at the front-line but repelling counter-attacks during the liberation of occupied villages. “At first we were being trained by women from the People’s Protection Units of Sinjar (HPG) on the border with Syria and other regions of Iraqi Kurdistan. Nowadays we are mostly involved in operations to liberate Yazidi hostages who have been captured by Daesh. My own relatives are among them,” said Wadhat. This 22-year-old lady was once a normal girl with academic goals and career ambitions. However, the infamous Yazidi genocide of 2014 compelled her to take up arms. Now she has the only wish: to liberate all the Yazidi women who were captured by Daesh in Iraq and return peace to the region. “I am addressing all the Daesh militants and their commanders: “We will wipe you out from the whole of Iraq! You will be fully ruined!” she said. The Yazidis came to broad public attention after Daesh fighters captured Mount Sinjar in northern Iraq in 2014 and engaged in systematic slaughter. Kurdish and Yazidi fighters retook Sinjar last fall. The Genocide agaisnt the Yazidi religious minority in Iraq and Syria has been admitted by the UN human rights panel. It stated that Daesh have committed genocide and other war crimes in a continuing effort to exterminate the Yazidis. The investigators detailed mass killings of Yazidi men and boys who refused to convert to Islam, saying they were shot in the head or their throats were slit, often in front of their families, littering roadsides with corpses. Dozens of mass graves have been uncovered in areas recaptured from Daesh and are being investigated. The UN investigators based their findings on actions taken by Daesh since August 2014 against 400,000 members of the Yazidi community, followers of a centuries-old religion drawing on many faiths. More than 3,200 Yazidi women were still being held by Daesh, the panel found. The report compiled by the panel — based on interviews with survivors, religious leaders, smugglers and medical personnel, among others — had identified individuals responsible for acts of genocide and provided “a road map for prosecution”. Mass killings were only part of the Daesh systematic campaign to eliminate the Yazidi community, the panel found, citing documents that revealed careful planning for treatment of the community after it was overrun and a “massive organizational effort” to coordinate the actions of fighters across Iraq. “Daesh made no secret of its intent to destroy the Yazidis of Sinjar, and that is one of the elements that allowed us to conclude their actions amount to genocide,” the panel concluded. “No other religious group present in Daesh-controlled areas of Syria and Iraq has been subjected to the destruction that the Yazidis have suffered,” the report finally stated.